Can YOU help Gucci get her seizure medications? Our Ruff Riders family members — Linda and her pets Gucci, Onyx, and Blue — need YOUR help! Sweet little Gucci has a seizure disorder and needs a vet exam, bloodwork, and ongoing medication. Linda and her family have been going through some tough times, and to make matters worse, their previous veterinarian — the ONLY veterinarian in their neighborhood — shut down unexpectedly. 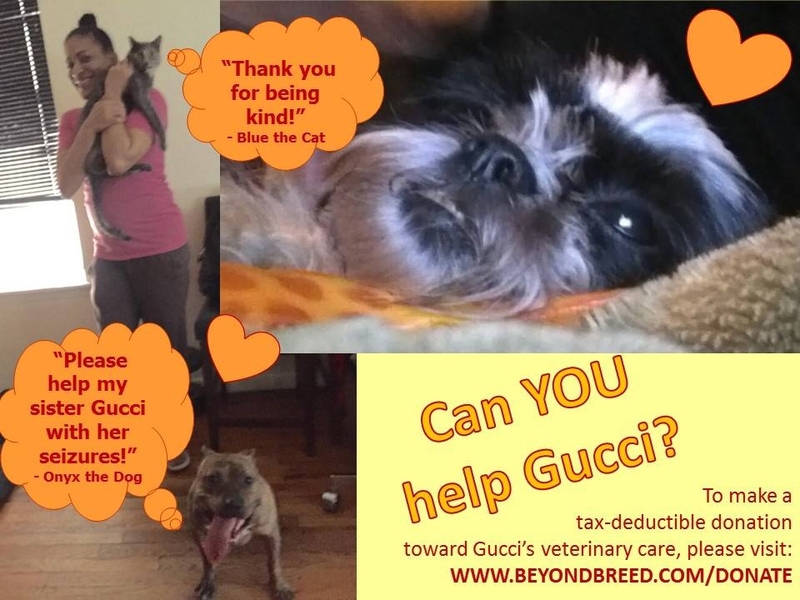 We want to help Gucci get well again, but we need your donations to do it!! Linda and her pets have been Ruff Riders family members for a few months. When we delivered pet food and supplies to their home in Brooklyn, we got to meet Onyx — who was rescued from a dog fighting operation in Queens and now lives with this lovely family — and Blue. Sadly, we couldn’t meet Gucci because she was having a seizure at the time. It was very sad to watch but even sadder for Linda and her family. Anyone who has had dogs with seizure disorder knows this. Can YOU make a tax-deductible donation to help Gucci? We need to raise at least $200 — $45 for the vet exam, $100 for bloodwork, and $65 for a 3-month supply of medication. But anything beyond that will go toward her ongoing expenses, since dogs with seizure disorder require regular vet exams and monthly medication.